Damien Johnson owns and operates Charlotte, N.C.’s No Grease Barber School and knows firsthand how mental illness impacts his clients. Johnson says he hears stories day in and day out of men struggling – not with bills or relationships – but with mental illness, depression and thoughts of suicide. “As men, they don’t readily share these struggles, but when they sit down in a barber chair, it’s a safe place where they feel comfortable telling it all,” Johnson said. Johnson wanted to better support the common themes he was hearing from clients. 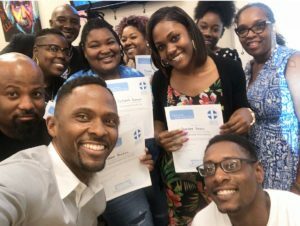 He came across Atrium Health’s Mental Health First Aid initiative and saw it as a great partnership opportunity to provide training to students who are preparing to become barbers and hairstylists. These men and women have a unique position in a community saturated in stigma and in need of helpful mental health resources. The eight-hour Mental Health First Aid course helps the barbers recognize the signs of mental illness and get clients the support they need. Sheila Wright, a Mental Health First Aid Instructor at Atrium Health, said barbers and hairstylists can be the gatekeepers for people who are going through a mental health crisis. “This course equips them with the ability to spot the signs – from depression to suicidal thoughts – and then direct people to get help,” Wright said. Since its inception in 2013, more than 12,000 people have taken Mental Health First Aid courses through Atrium Health. The free course is available in Spanish and English to individuals and groups across the community, including employers, faith communities, public health and safety officials, veterans’ organizations, youth/adolescent groups and agencies, and Latino organizations. Learn more about Mental Health First Aid training at Atrium Health and how you can sign up. Or, if you’re not in an area served by Atrium Health, find a class near you. 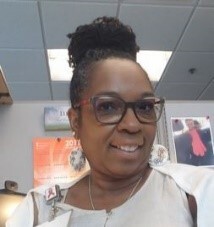 Sheila Wright, MSN, RN is a Coordinator for York and Mecklenburg Counties, NC and a Mental Health First Aid Instructor at Atrium Health.